Do you need some great stocking stuffers? 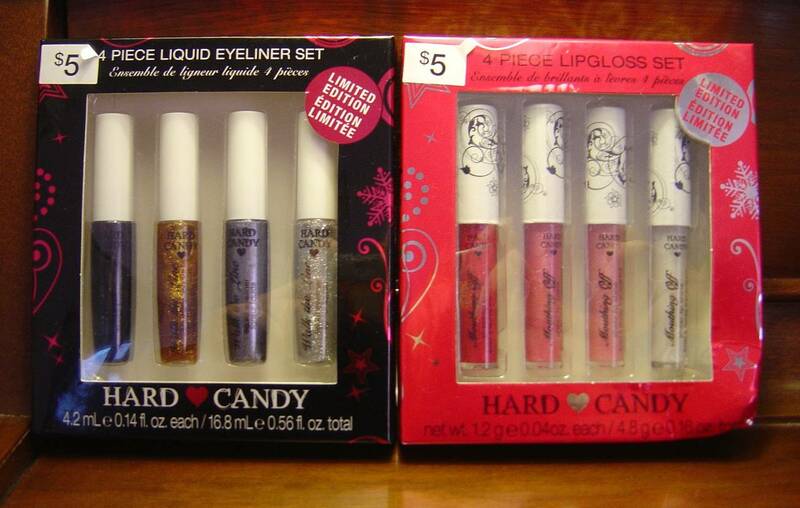 Hard Candy Cosmetics sent me a few of their 2011 Holiday Gift Sets for lips, eyes, and nails that would please any young woman for this review and giveaway. Their 4 Piece Mouthing Off Lipgloss Set is a limited edition of sheer shine and luscious color to provide instant holiday glamour in four mini tubes. Another fun set was the 4 Piece Liquid Eyeliner Set with a classic black color to brighter sparkling shades for show stopping attention. This is a collection of four of their Walk the Line liquid eyeliners in limited minis that dry quickly and stay put for hours! I also was sent four mini bottles of Hard Candy’s Limited Edition Nail Polishes with Heart Rings. These bold, glittery shades are perfect for getting into the holiday mood. Glam it up with these long-lasting polishes that are void of DBP, toluene and formaldehyde for chip-resistant nails for parties or whatever the occasion. If you ask me, these holiday collections are a great way to sample some of Hard Candy Cosmetics fantastic products at a fraction. You can find these special sets only at Walmart. So stock up and experiment or give as gifts because these sets only stick around for a limited time! 1. You must follow me on Google Friends Connect before any of your entries will count. If you already follow, then tell me the name you follow me by in a comment and email (if not in your profile)–in a comment. 2. Go to Hard Candy Cosmetics and tell me another product or something else you learned from their website in another comment. Leave a separate comment for each entry. Please include your email address inside your comment so I can contact you if you win. This giveaway is only open to residents of the United States and Canada. Do follow the rules because I check entries. Be alert that if you attempt to enter using multiple identities will be grounds for disqualification. This giveaway ends December 13, 2011 at 12 PM Eastern Standard Time. The winner will need to respond to my email with name and shipping address within 48-hours or another winner will be picked. Next Post Easiest Custard Pie That Makes its Own Crust! I follow via GFC as Glogirl. I would love to try the Glitteratzi Body Spray in Citrine. I entered the Monave Mineral Makeup Mini Bling Gift Bag Giveaway. I liked the Sheer Envy – Moisturizer! I follow via GFC I'd like to try the Lumenizer. The Lask Ink – 4 day lash stain looks interesting. I've never seen a product like that before. Would definitely try their Plumping Serum. Followed Hard Candy on fb under Clover Brittany Brannon. Followed Hard Candy on FB under Clover Brittany Brannon (2). i would like to try the plumping Serum lip gloss catherine0807@hotmail.comthanks for awesome giveaway! gfc follower – reeva m.
would love to try the sequin shine lipgloss! I like Hard Candy on FB as Susan Chester. I'm a GFC follower (Gianna).Glitteratzi Body Spray. Im a GFC follower and I like the shine lip gloss. I really like the Walk the Line liquid eye liner on the hard candy website. I follow you on GFC as jasmyth and my email is jasmyth@shaw.ca I like the glizerazi body spray.. The plumping serum lip gloss! GFC follower: Atreau.I'd like to try the Glitteratzi Body Spray. I'd like to try the Button Your Lip – Brush On Push Button Lip Gloss Pen & Automatic Lip Liner in Luxe! I learned that the company is located in Carteret, New Jersey. I tweeted the requested message on Twitter at https://twitter.com/#!/likwan/status/146589611798429696. I learned that they have flavored body powder. Show Girl-All Over Body Glitter is another product. I love their little mini musthaves packages! i am a new follower. i think my daughter would LOVE Glossaholic in Sequin Saturated Shine Lip Gloss.